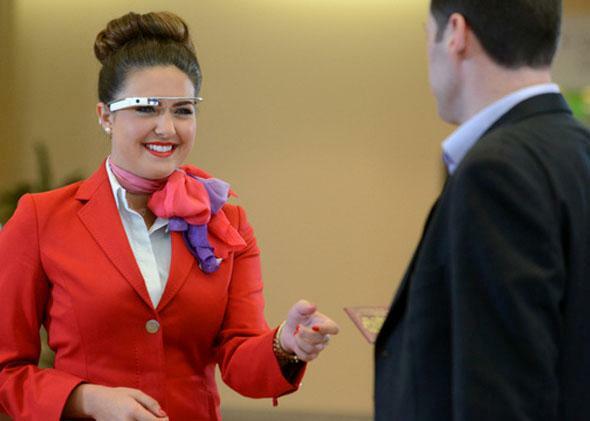 Google Glass at Virgin Atlantic: Piloting wearables like smartwatches for passenger check-in. This is the scene that could greet you the next time you go to the airport. Sometimes people freak out a little bit when they see someone wearing Google Glass. It’s understandable because Glass presents new and largely unexplored privacy concerns, but the device and other wearables have so much potential that they’re not going anywhere. And Virgin Atlantic seems ready to embrace the trend. The company is running a six-week trial in which employees at a certain Heathrow airport terminal will wear either Google Glass or Sony’s SmartWatch 2 so they have fast access to passenger data. Virgin employees will be able to “start the check-in process” for passengers, update them on the weather at their destination, and use Glass for foreign language translation if applicable. Just because you’re flying out of Heathrow doesn’t mean you’ll be face to face with some Glass, though. The pilot is only running in Virgin’s Upper Class Wing for top-of-the-top flyers. Upper Class (is that really what it’s called?) is above first class and a bunch of other tiers of preferred customers. In the Upper Class Wing, there’s a fancy bar and spa, and you can drive up in your limo, which seems to be the crux of the program in a way. Virgin isn’t using facial recognition (a particularly murky area in terms of Glass-related privacy) to identify passengers, so it seems like the pre-registered limos are going to help employees know who’s who. They can also use names or reservation numbers in the custom Glass and Sony SmartWatch apps to pull information up. Virgin partnered with the IT group SITA to build custom apps and coordinate the pilot. Outfitting employees with Glass may not be widespread yet, but if Virgin is doing it other businesses will probably follow. This is what it feels like to be a celebrity where everyone knows your name.